I've become very fond of Hot Key Books as they publish a variety of high quality and unique young adult novels that stay with me long after I turned the final page. 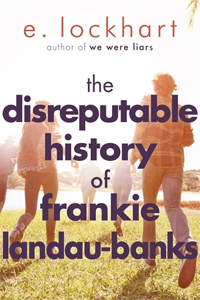 Recent titles I've fallen in love with are Say Her Name by James Dawson and Breakdown by Sarah Mussi, and after reading The Disreputable History of Frankie Landau-Banks by E. Lockhart this wonderful book is going straight on that love-list too. While the novel had a bit of a slow start, once it picked up it not only turned into a very compelling story, but it also provided an intelligent social commentary on gender perception and the imbalance that still exists between girls and boys; making it an excellent read for young women and men alike to make them question the status quo. Frankie Landau-Banks is a clever young girl privileged enough to attend Alabastar Preparatory Academy, a boarding school which preps its students for the Ivy League universities. At the start of her time at the school she is not one of the most popular girls, but having an older sister showing her the ropes certainly helps her make friends and she soon mingles both with the geeks and the popular seniors - and she even gets a boyfriend. However, fast-forward a year and her sister Zada has left for Berkeley. Frankie now has to get by on her own and she soon does pretty well for herself, even snapping up an older boyfriend which secures her a spot on the popular table during lunch. But she soon starts to realise that while she sits at the popular table and is accepted by the senior students, that she's not really a part of their group and she starts to investigate what is causing this, as she wants to be seen as an equal, not the cute younger girl who isn't respected. It doesn't take long for Frankie to realise that her distance from the group has something to do with the secret society at the school, The Loyal Order of the Basset Hounds. Her own father was a member and he never kept this from his daughters, so Frankie already has more knowledge on it than the average student - and even many of its members. Frustrated by being excluded and prompted by an assignment in one of her classes, she decides to make a difference and she takes matters into her own hand. I've always been intrigued by the decades old secret societies at American universities and the tradition of getting tapped, the initiation process and most importantly, forging exclusive friendships with people who are expected to become powerful players once grown-up; important allies that will help aid you for the rest of your life. As they are secret, most of the lore surrounding these societies are solely based on rumours, but a story such as The Skulls (a movie based on the theories surrounding by the Skull and Bones Society at Yale) certainly make it all seem very plausible and I loved that this novel brought the conspiracy to a younger and more contemporary audience. What also made this book stand out was that rather than having a male main character, as so often is the case when it comes to secret societies, it was in fact an intelligent young woman who took on the task of uncovering the mystery, while simultaneously highlighting the outdated gender discrimination that goes hand in hand with these exclusive membership clubs. Add to that Frankie's unique perspective not only on the obsolete gender imbalance but also on her courses at school and even language in general (Frankie is a big fan of the neglected positive, and her avid use of them did make me question why these useful words are not more commonly used), and the entire novel made for a fresh and interesting reading experience. Young adult novels tend to focus heavily on love stories, more often than not one where the girl is heavily reliant on the boy. While there is certainly an element of romance in The Disreputable History of Frankie Landau-Banks, I found that the social commentary and clever use of words made this a far more intelligent and thought-provoking read, one which will hopefully help bring a much-needed change to the imbalanced view on gender which still prevails in the 21st century.